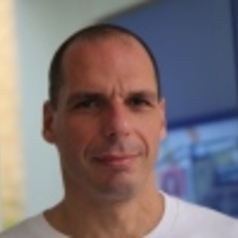 Born in Athens, 1961, Varoufakis read mathematics and economics at the Universities of Essex and Birmingham. A professor of economics at the Universities of East Anglia, Cambridge, Sydney, Glasgow, Athens and Texas, he was writing obscure academic texts for many years until thrust onto the public scene by Europe’s inane handling of an inevitable crisis. Varoufakis served as Greece’s Finance Minister (January to July 2015) and remains a Member of the Hellenic Parliament.